2018 wraps up as one of the wettest years on record for Rockford, but also for many in the Midwest and across the country. 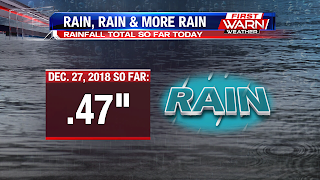 The 0.60 inches of rainfall (as of 8:30pm Monday night) pushed the yearly rainfall total up to 49.60 inches, preliminary making it the third wettest year on record for Rockford. 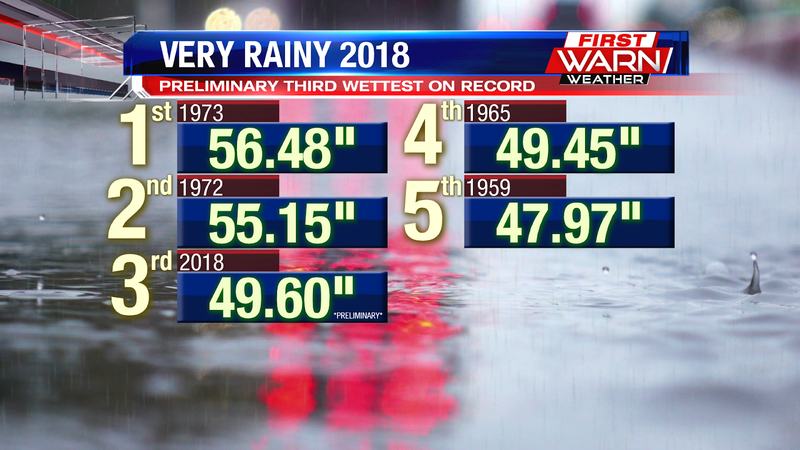 The wettest year on record was back in 1973 when 56.48 inches of precipitation fell. The wettest month this year was June when almost 10 inches of rain was recorded in Rockford! The majority of the rain Monday evening is done, but has transitioned over to snow. 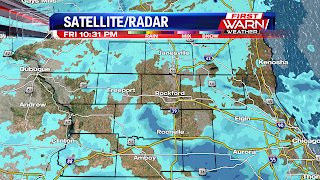 Light snow and flurries will continue through most of the night, into Tuesday morning. Moderate rain continues to fall over much of northern Illinois, but the transition over to snow has already started over southern Wisconsin and northwest Illinois. As temperatures continue to cool closer to freezing Monday evening, the transition over to light snow will take place from west to east through roughly 9pm/10pm. 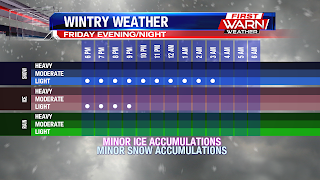 will mostly remain on grassy surfaces and stay under an inch. 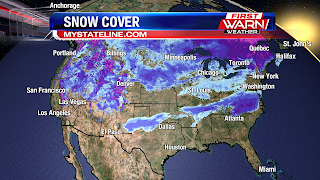 Snow has been accumulating further north across Wisconsin where several inches of snow have already fallen. As some of the moisture in the atmosphere decreases overnight, there is the potential for very light freezing drizzle to mix with some of the flurries. No ice accumulation is expected, but the freezing drizzle combined with temperatures near and below freezing could make untreated roads a little slick for those coming home following New Year's Eve celebrations. Skies will remain cloudy to kick off the new year. There may even be a few flurries around through the afternoon. 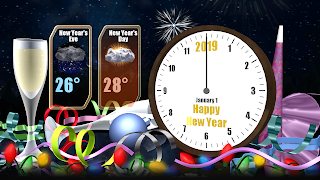 As you are preparing to ring in 2019, expect the rain from today to transition to some light snow/wintry mix tonight. It is going to be a chilly start to the new year with highs New Year's Day and Wednesday only topping out in the 20s. 30s and 40s arrive as we end off the week and head into the weekend. While it will be a chilly start to 2019, thankfully it won't be as cold as last year. 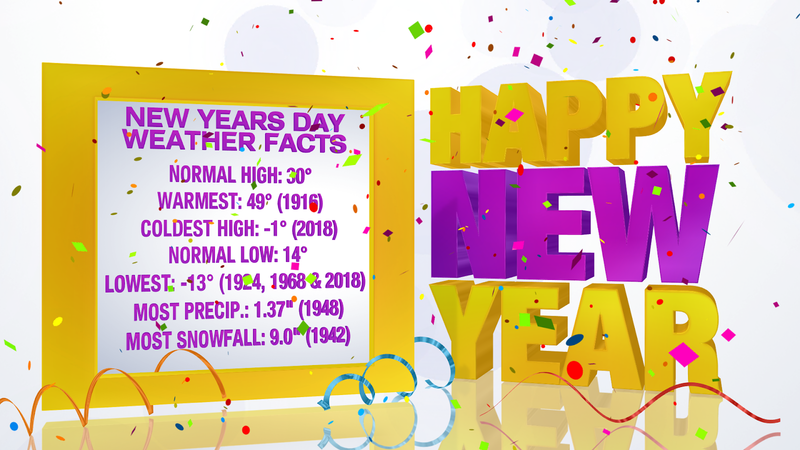 Last year we set the record for coldest high temperature on New Year's Day of -1° and tied the lowest low temperature of -13°. While we might see a few flakes early January 1st, 2019, we won't see as much as we did back in 1942. 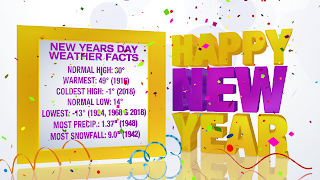 We saw 9.0" New Year's Day of 1942, which made it the most snowfall on record for New Year's Day. 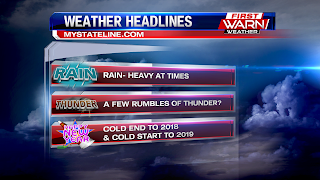 Not only is it going to be rainy today throughout the Stateline, but also in Times Square for the ball drop. 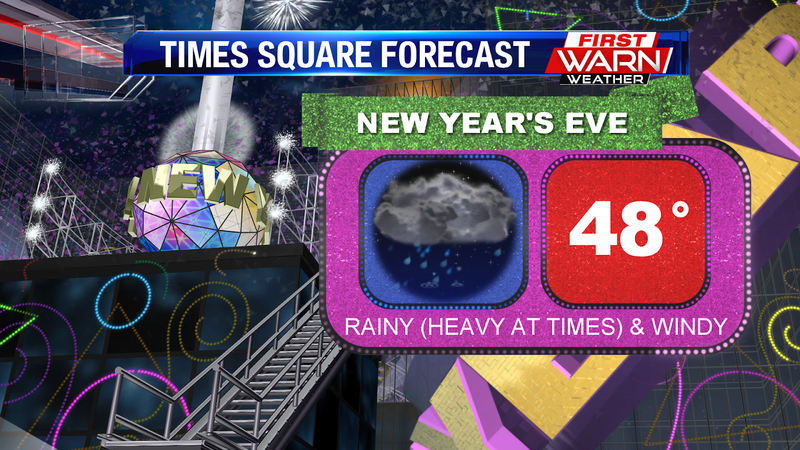 Those ringing in the new year from Times Square are going to need the ponchos with rain, heavy at times, likely. It will be rather breezy too. 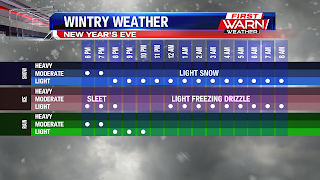 MIXED WINTER WEATHER FOR NEW YEAR'S EVE! After a sunny and seasonable Sunday, we've got some changes on our horizon for New Year's Eve. 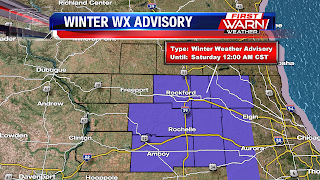 The National Weather Service has issued a Winter Weather Advisory for the entire Stateline area for possible Freezing Rain between 4 am and 9 am tomorrow morning. Models are showing light to moderate rain after 9 am for the bulk of the day, and then in the evening a switch back to light snow or snow flurries. Big Changes are also coming for our temperatures, which topped-out at 34 degrees today, 4 degrees above our normal of 30 degrees. 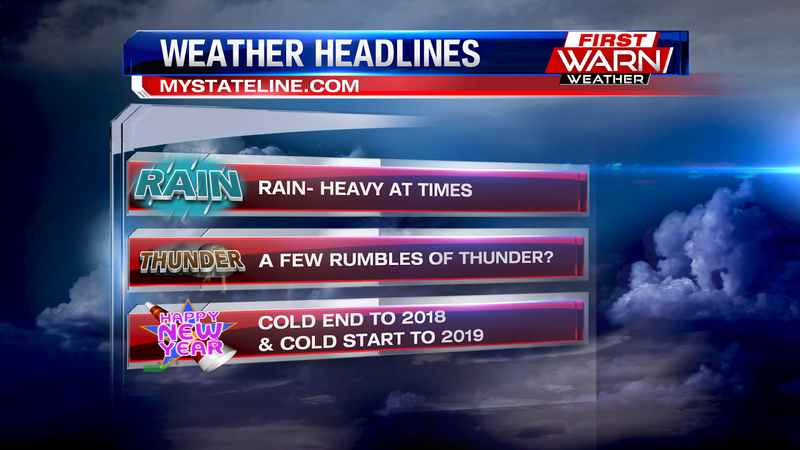 Tomorrow temperatures will be in the mid to upper-30's, but after the storm system passes, New Year's Day will be a cold one with a high of only 26 degrees, to be followed by even colder air on Wednesday with a high of 23 degrees. 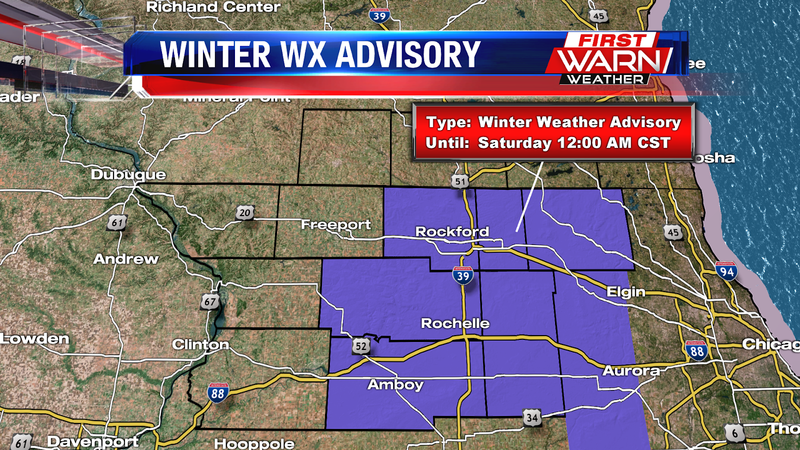 A Winter Weather Advisory continues for Winnebago, Boone, McHenry, Ogle, Lee and DeKalb counties until Midnight. 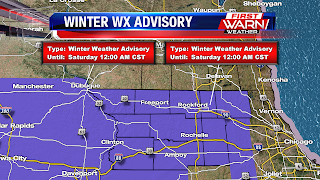 It has been canceled for Stephenson, Jo Daviess, Carroll and Whiteside counties. 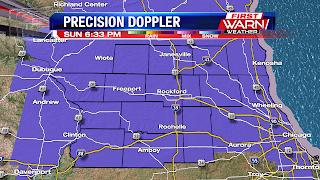 The threat for freezing drizzle has come to an end for most, but light snow will continue through the overnight. Minor accumulations have taken place, mostly on grassy surfaces, but untreated surfaces have also experienced accumulation. 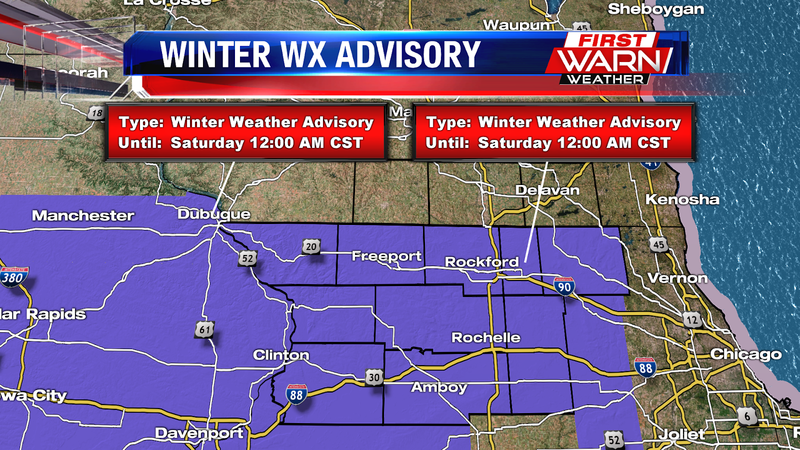 The light snow/flurries will continue into Saturday morning with mostly cloudy skies expected for Saturday afternoon. 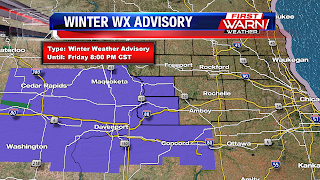 The Winter Weather Advisory has been canceled for Stephenson, Jo Daviess, Carroll and Whiteside counties. 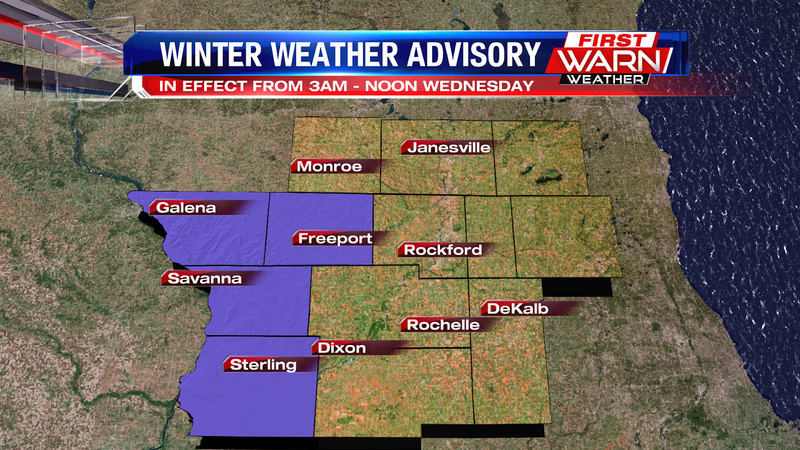 The Advisory continues for Winnebago, Boone, Ogle, Lee, DeKalb and McHenry counties until Midnight. 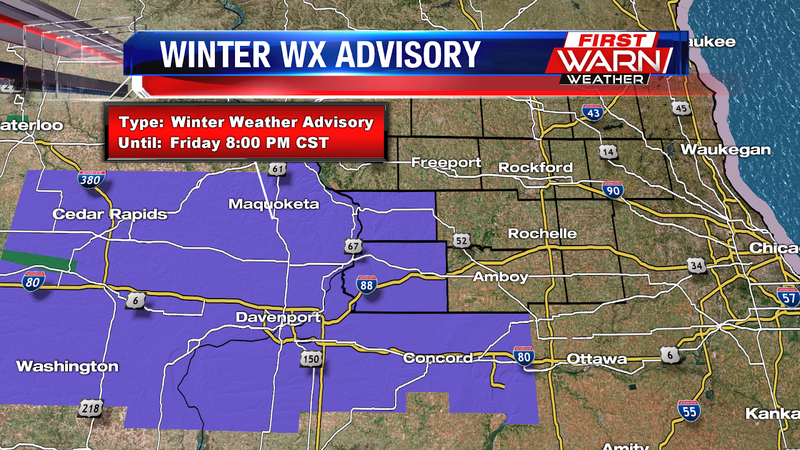 A Winter Weather Advisory has been issued for Carroll and Whiteside counties until 8pm Friday evening. Light freezing drizzle has been mixing in with some of the snow late this afternoon and is expected to continue into the evening. While accumulations are expected to remain light, minor ice accumulations are possible (thin glaze) on elevated and untreated surfaces. 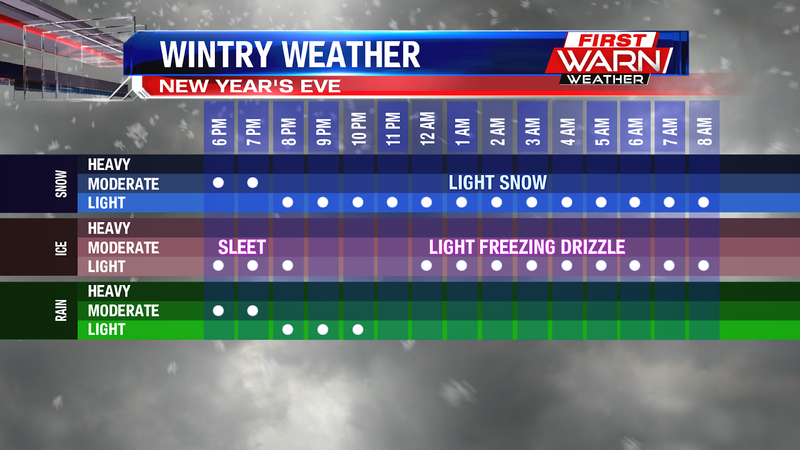 This could make travel a little slick through the evening. Last night we had a little bit of wintry mix, but since then it has been rain, rain and more rain. Rain will continue to be the story throughout the day, and at points will be heavy. A few rumbles of thunder can't be ruled out. 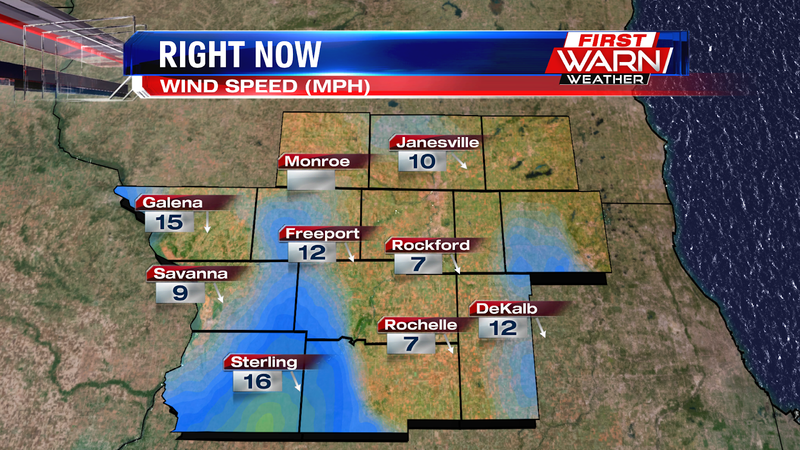 Winds will continue to be blustery with gusts topping 30mph. After today, temperatures plummet to end off 2018 and start 2019. 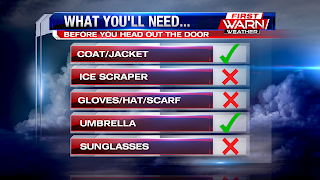 Expect highs to be in the upper 20s and lower 30s. We will end up some nearly 20° above normal this afternoon with highs expected to warm into the upper 40s to near 50°. It doesn't last long as we will be some 20° colder by Saturday. 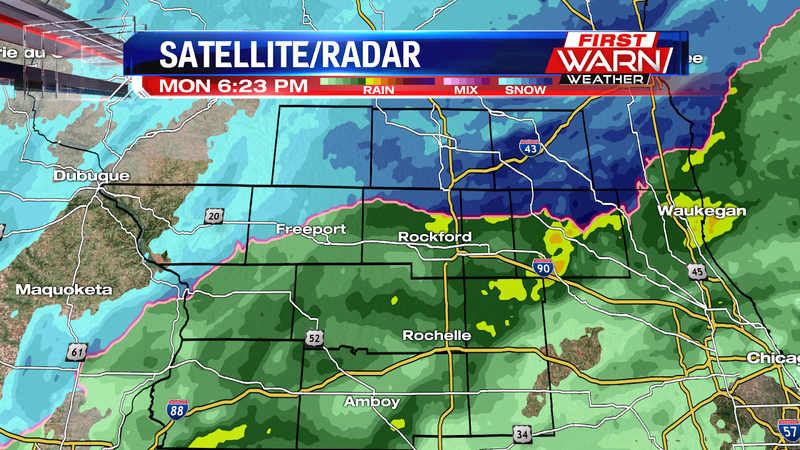 So far we've picked up just shy of a half an inch of rain at the Rockford International Airport. 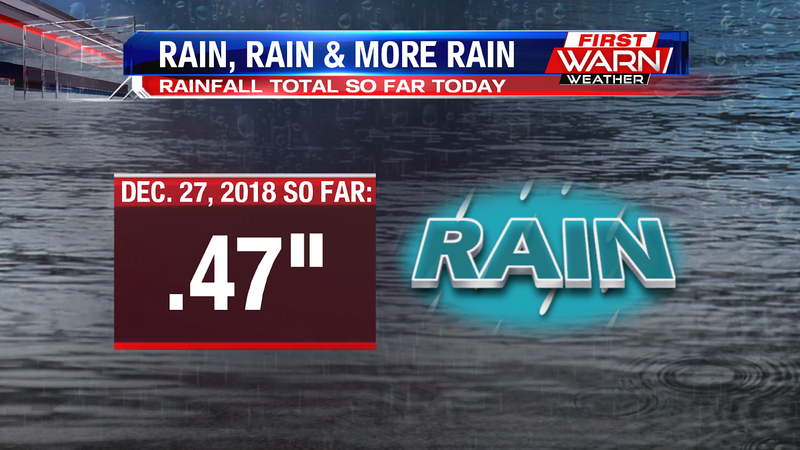 We will only add to that total as we go throughout the day and into the evening hours. 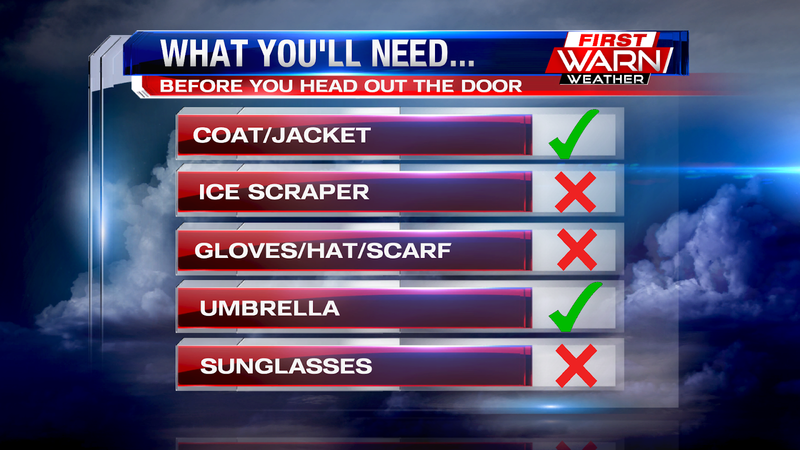 So make sure you have your jacket and umbrella handy before you head out the door... or you might get a little wet. After a warm Christmas with highs in the mid 40s, we will yet again be above average today. Highs this afternoon will top out in the lower 40s, which is some 12° above normal. 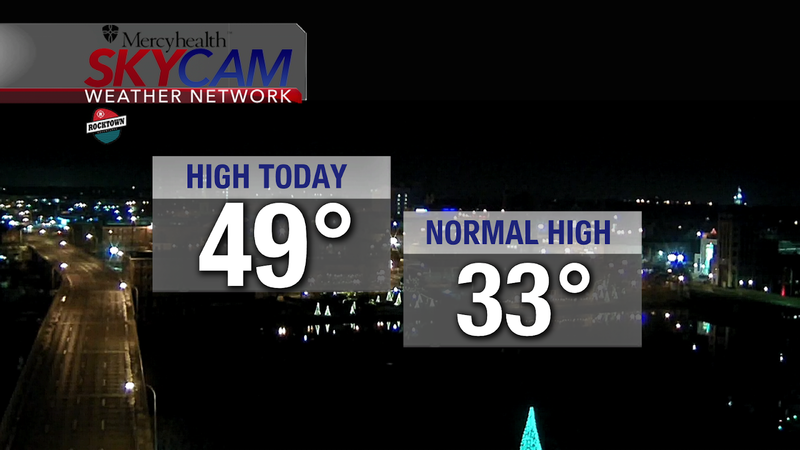 Our average high should be in the lower 30s. 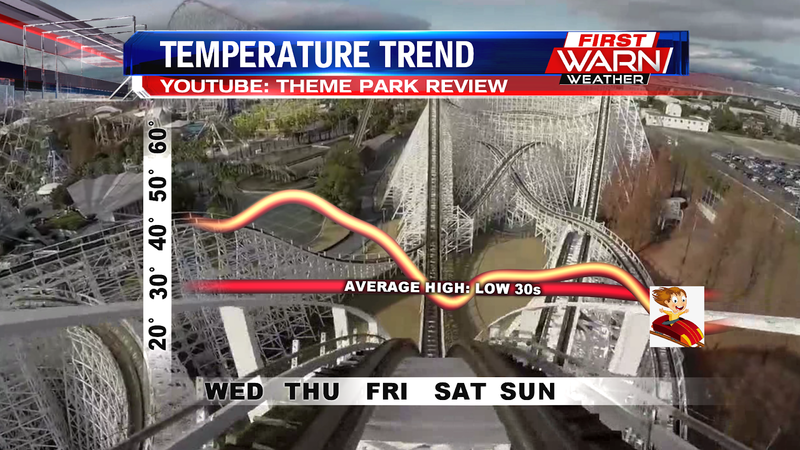 Thank you for riding the First Warn Weather Roller Coaster. Please remain seated keeping your arms and legs inside the vehicle at all times. 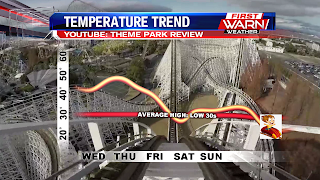 Hold on tight for this roller coaster ride of temperatures! Highs tomorrow in the upper 40s and then some 20 degrees colder with highs in the upper 20s by Saturday. It appears the cooler than normal conditions will linger into early next year. 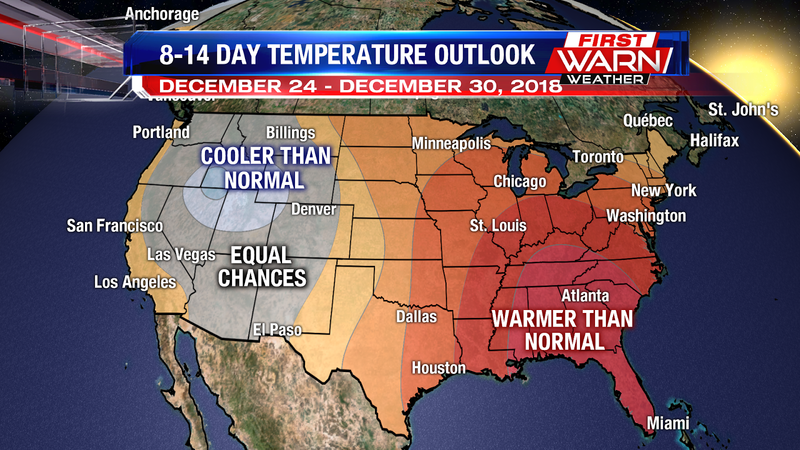 The 8-14 day temperature outlook shows cooler than normal conditions for central and eastern portions of the U.S.
HO HO HO MERRY CHRISTMAS? 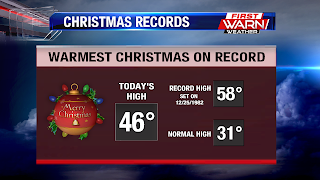 It was an unseasonably warm Christmas Day across the viewing area today as temperatures soared into the mid & upper 40's. The official high recorded at the Chicago-Rockford International Airport was 46 degrees. That begs the question, was this the warmest Christmas on record. Almost, but not quite. The warmest Christmas on record happened back in 1982 where the official high was 58 degrees. 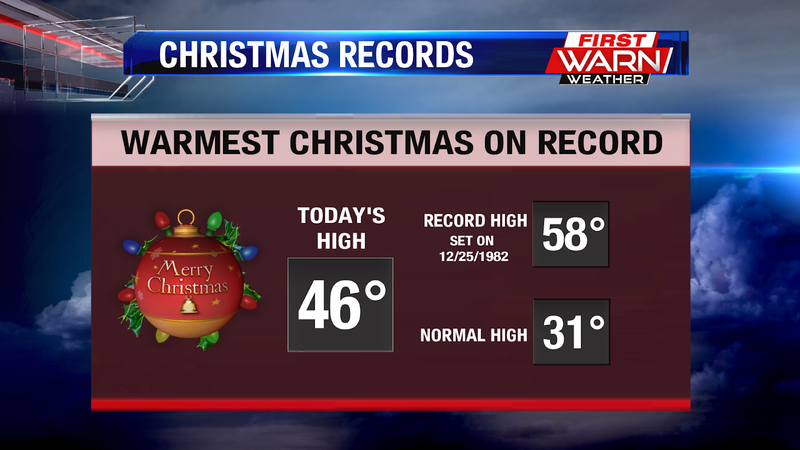 In fact, the high today was ended up right in the middle of our record high and the normal high. Our temperatures in fact have been on a crazy roller coaster ride this past week. Only one day was near seasonable and that was on Saturday where temperatures only reached 31 degrees. 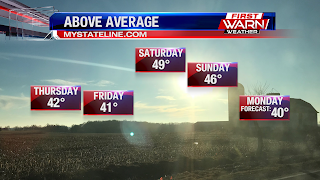 The roller coaster continues as we head into the weekend as our next system will push temperatures into the 40's the next three days. 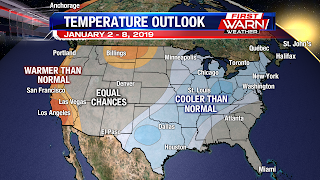 Then we can expect temperatures to be more winter-like starting this weekend. 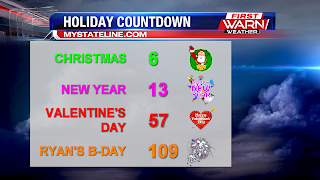 For those of you who are still scheduled to travel for the holidays, tomorrow wouldn't be a bad day to travel. 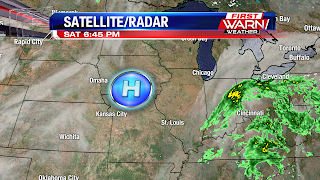 A high pressure system will move closer to the Stateline region tonight which will allow skies to gradually clear by tomorrow morning. 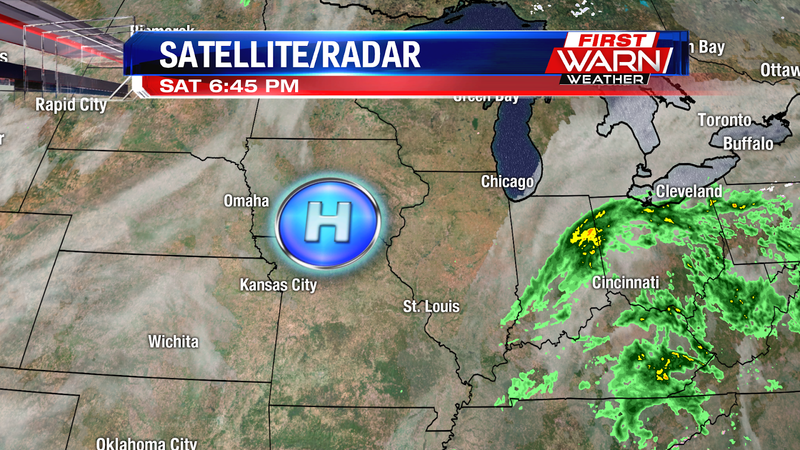 This high pressure system will stick around for a majority of the day tomorrow. Expect mostly sunny skies with less breezy conditions and high's in the mid 30's. In other words, it will be a great day for you to travel to your holiday destination. 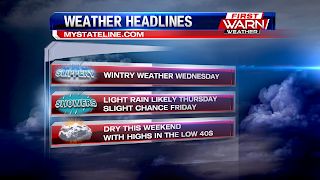 A change in the weather pattern is expected late Christmas Eve as the high pressure system begins to move out. This will allow a weak low pressure system to swing through the region bringing with it a chance for light snow early Christmas morning. Although we are not expecting much accumulation, it will be nice to wake up and see not only presents underneath the tree, but also snowflakes as well. Temperatures on Christmas Day are expected to rise above the freezing mark which will help the snow changeover to a light rain during the late morning-early afternoon timeframe. Overall, expect mostly cloudy skies with a chance for a mix with a high near 37 degrees. Happy first day of winter everyone. Today, the winter solstice occurred at 4:23 PM marking the transition into the season of winter. 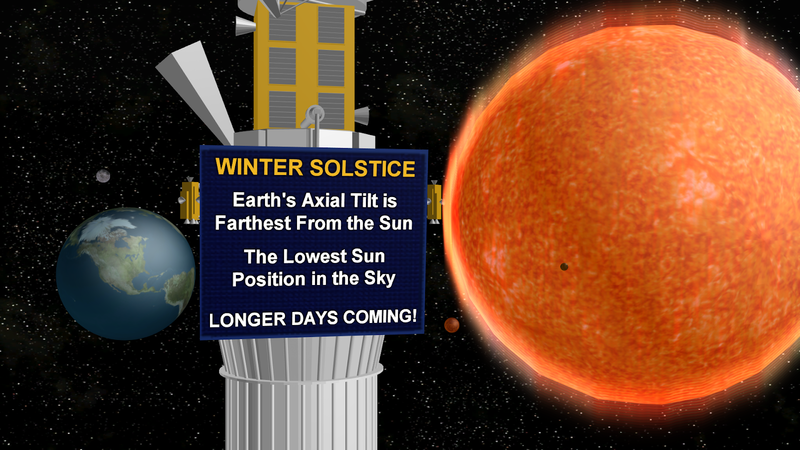 Now, what actually happens during the winter solstice? During the winter solstice, the earth's axial tilt is the farthest from the sun. The angle of earth's tilt determines where a majority of the sun's energy gets observed. A combination of this plus the sun being at it's lowest position in the sky makes it winter in the northern hemisphere, and summer in the summer hemisphere. And with the winter solstice being the shortest day of year with only 9.5 hours of daylight, the days only get longer from here. What is cool is that we have a full moon happening on the same day as the winter solstice. Decembers moon is known as the cold moon which is named for the arrival of winter. Tonight's forecast calls for decreasing clouds with a slight breeze. 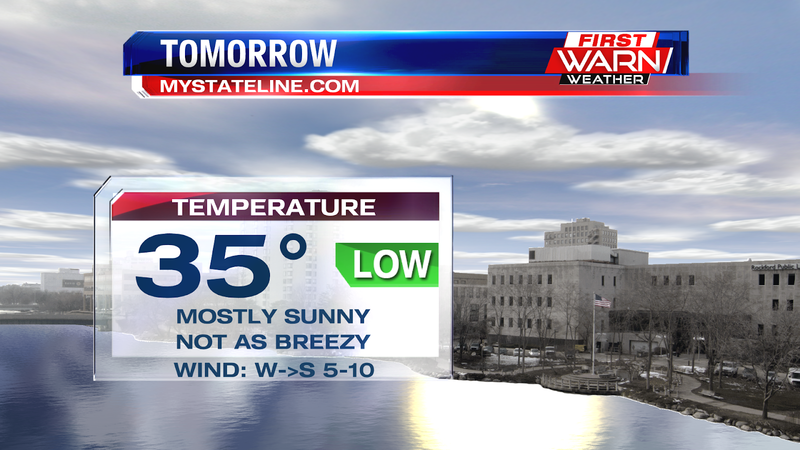 It will get chilly however as we are expecting a low around 22 degrees. 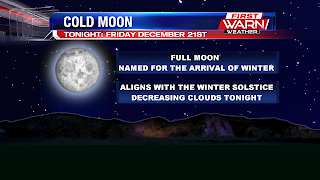 Overall, it is still a beautiful night to go observe this cold moon. And maybe a few meteors as well! As the rain continues to move out of the viewing area, we can expect the winds to ramp up throughout the night tonight and into tomorrow. This is all due to three weather systems, one high pressure system and two low pressure systems, interacting with each other. As they pull closer and closer to each other, they will create what we call a tight pressure gradient in our atmosphere. And the tighter the pressure gradient is, the stronger the winds will end up. Tonight, we can expect winds to blow out of the northwest at 10 to 20 mph with some winds gusting up to 30 mph. 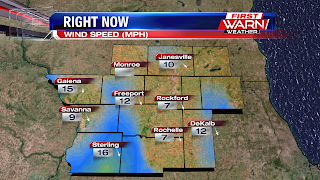 Currently, we are seeing some winds reaching double digits across the Stateline area. These winds will persist into tomorrow along with mostly cloudy skies and high's in the low 30's. Temperature look to become more December-like just in time for the Winter Solstice! Despite the cloud cover Wednesday afternoon, temperatures warmed into the mid and upper 40's area wide. 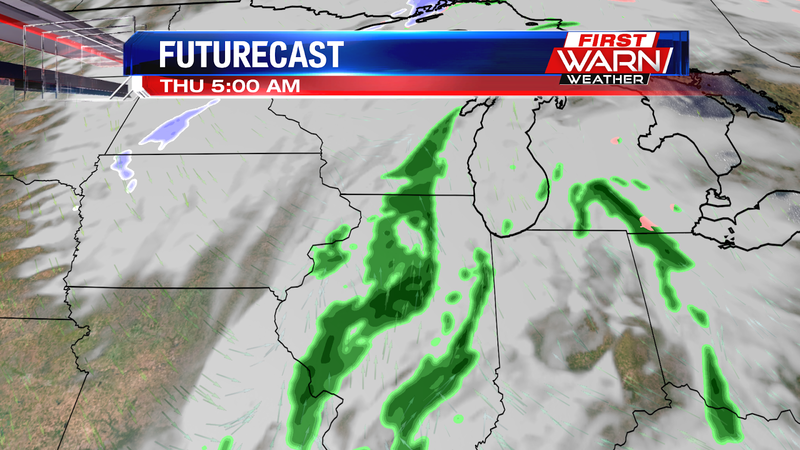 Cloud cover will remain thick Wednesday night holding temperatures in the upper 30's through Thursday morning. 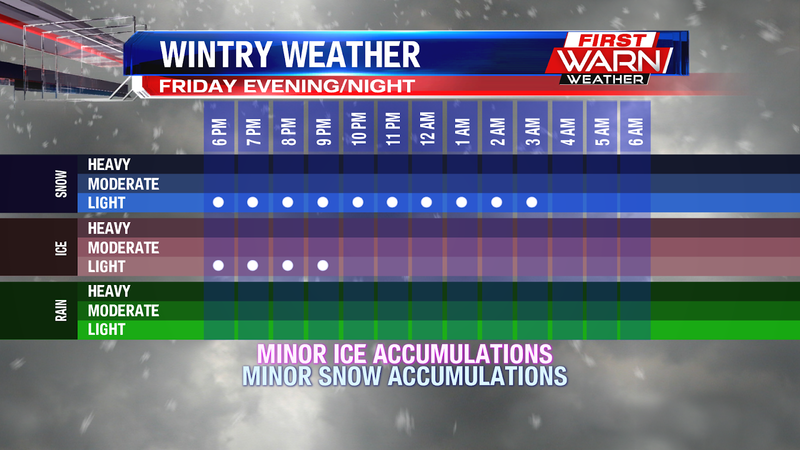 continue into Thursday afternoon before possibly mixing with a little light snow by Thursday late afternoon and evening. No accumulations are expected for snowfall Thursday. Temperatures Thursday will reach the low 40's, but will cool into the 30's late Thursday afternoon following the passage of the cold front. Highs through the end of the week and weekend will remain in the mid 30's. Sunshine Departs & Will We See A White Christmas? After sunny skies and above average highs for the last few days, the sunshine has been taken over by abundant cloud cover. The good news though... 40s remain in the forecast for today and Thursday. What also remains in the forecast is the blustery conditions. It was breezy yesterday, and that will remain the story today, Thursday and into Friday. 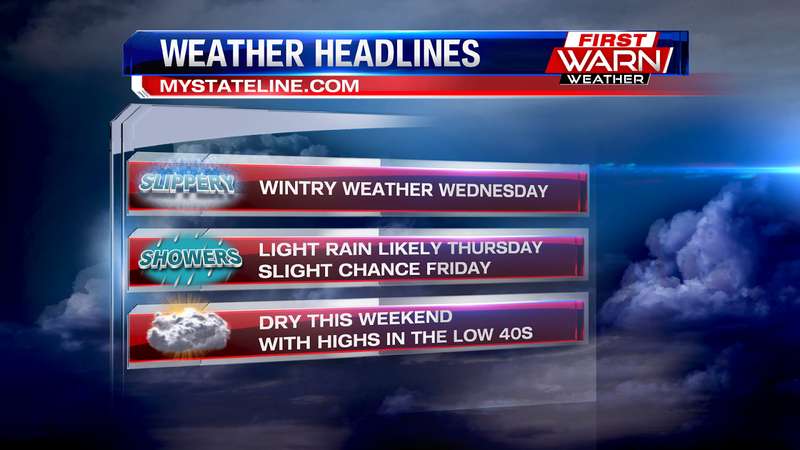 As a cold front approaches the area we will bring in the chance for light rain/mix tonight and into early Thursday. Believe it or not, but there is only 6 days left until Christmas and then 13 days left until 2019! While there are only 57 days left until Valentine's Day... the one that matters the most is Ryan's Birthday, and that's only 109 days away! 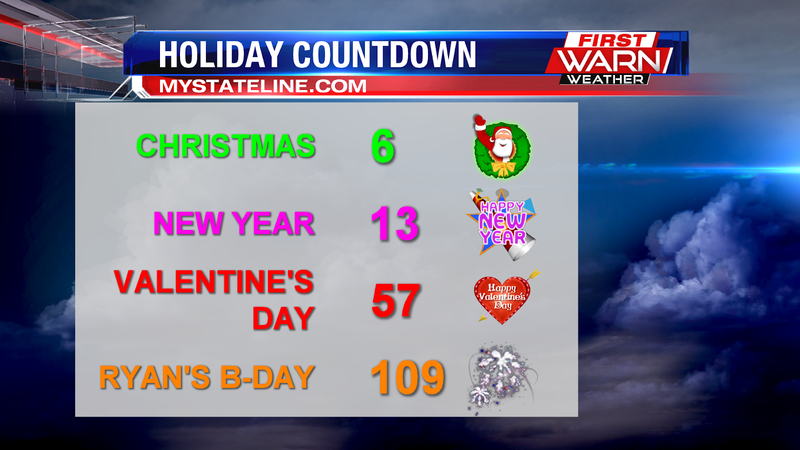 With Christmas only 6 days away, the popular question is always whether or not Ryan is on the naughty or nice list... ok maybe not that, but many people always want to know if we are going to see a white Christmas. The debate then is if a white Christmas is considered snowfall on Christmas and/or snow on the ground for Christmas. 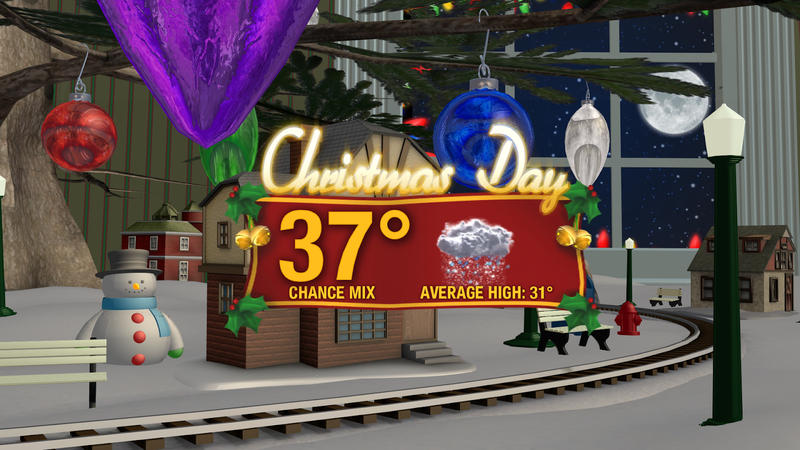 In this case, we have on average around a 50% chance of at least 1" of snow on the ground for Christmas. 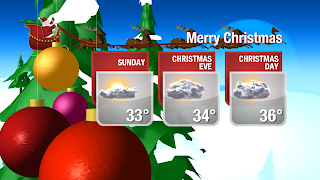 Looking ahead at the forecast going into Christmas, temperatures will be in the low to mid 30s under partly to mainly cloudy skies. We do have a slight chance for a little rain/snow mix on Christmas, but that is something we are definitely going to have to continue to watch as we get closer. 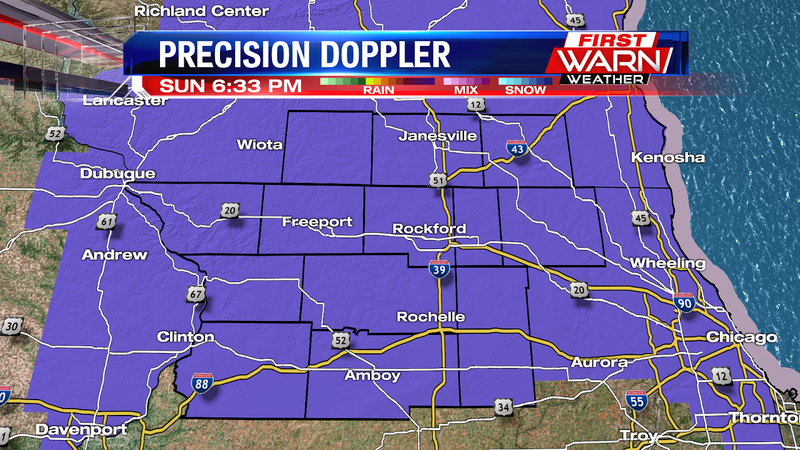 The official high today at the Rockford International Airport was 43 degrees. 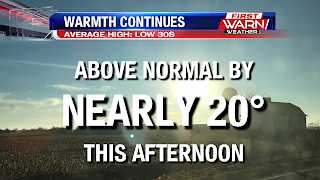 This makes it the 6th day in a row that our high temperatures reached 40 degrees or above. That's mighty impressive for December standards, especially when the normal high for this time of the year is closer to 33 degrees. As we take a look at the next few days, we still have two more days of this mild weather pattern with high's in the low 40's before December makes an appearance right before the weekend. Temperatures will cool down closer to seasonable with high's in the low to mid 30's throughout the weekend. Then we should expect a slight increase in temperatures for the start of next week leading up into Christmas. For Christmas Day, expect mostly cloudy skies with a high of 37 degrees. That is just a few degrees above the normal high of 31 degrees. 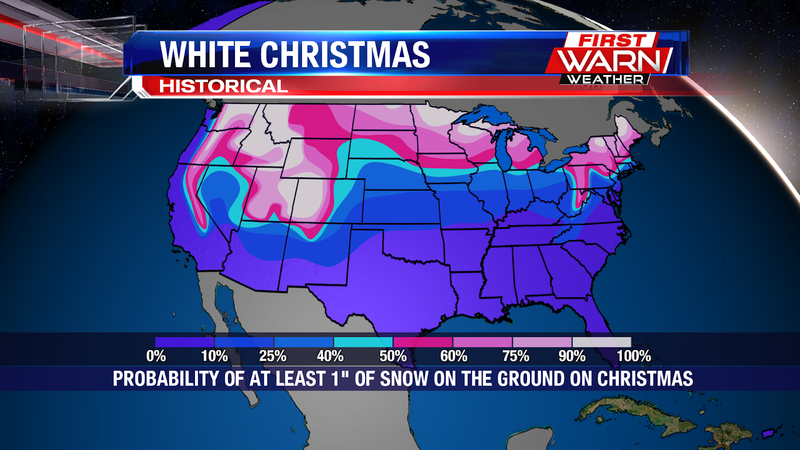 And sadly, the chance of us seeing a white Christmas in the Stateline region are very slim. If we do experience any precipitation in the next week, it will likely be in the form of rain. 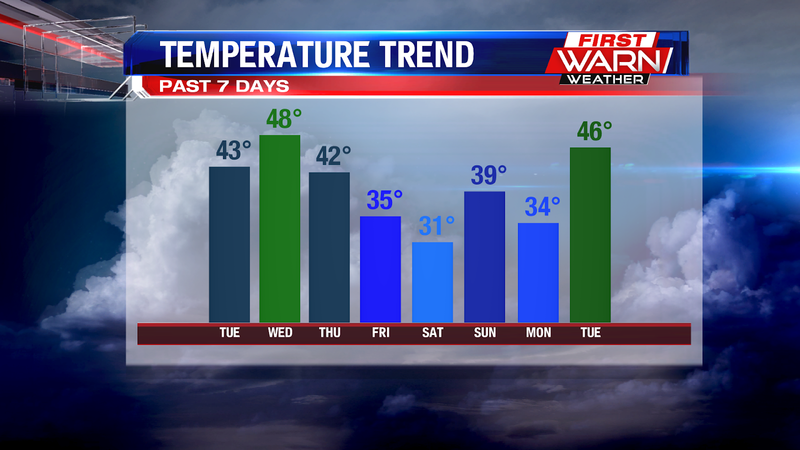 We have seen high temperatures top out in the 40s over the last four days. Thursday was the first 40° day this month, and Saturday we nearly hit 50°. 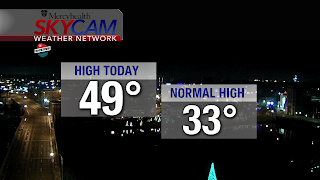 Highs today should come close to 40° today and remain in the lower 40s the next few days. The chances for a white Christmas are not looking good. 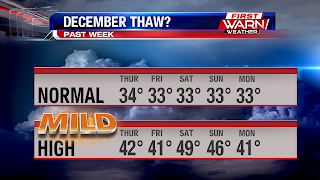 The above average temperatures of the last few days look to continue into the end of the year. 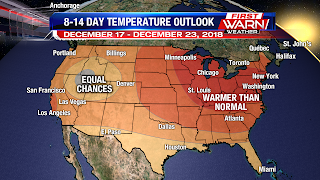 The Climate Prediction Center's 8-14 Day Temperature Outlook puts much of the central and eastern U.S. in warmer than normal conditions from December 24-30. Temperatures today were well above what we usually would expect for this time of the year. Our high temperature in Rockford reached 49 degrees, which is 16 degrees higher than our normal high of 33 degrees. We currently have high pressure overhead which brought abundant sunshine to the state line region throughout the day on Saturday. 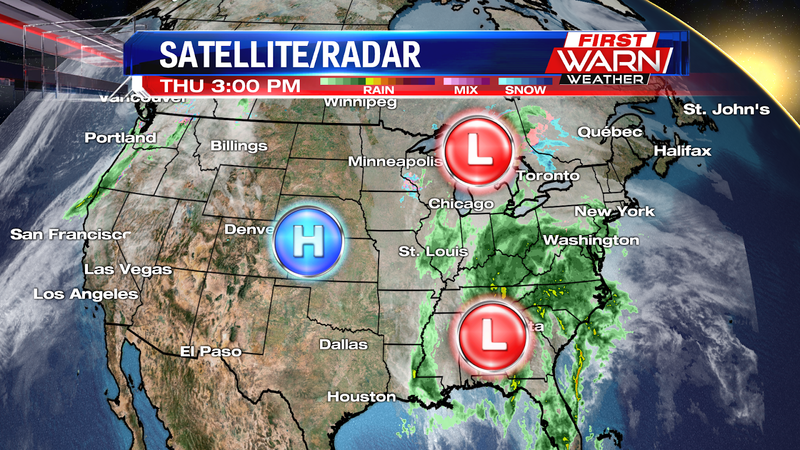 That high pressure looks to settle in for the next couple of days and bring nice weather to the viewing area into Tuesday. Weather for tonight looks quiet as we will have mostly clear skies with temperatures in the mid 20's. A cold front will pass through late tomorrow morning which will cool temperatures down into the upper 30's on Monday. But temperatures look to bounce back heading into Wednesday with high's in the low 40's. Although that sounds nice, that also comes with a chance for some light rain later on in the day on Wednesday. But up until then, the weather seems quiet as this high pressure will continue to bring sunshine to the area into the middle of next week! 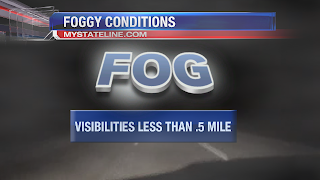 It's been a very foggy day out there as visibilities are continuing to deteriorate across much of the viewing area. 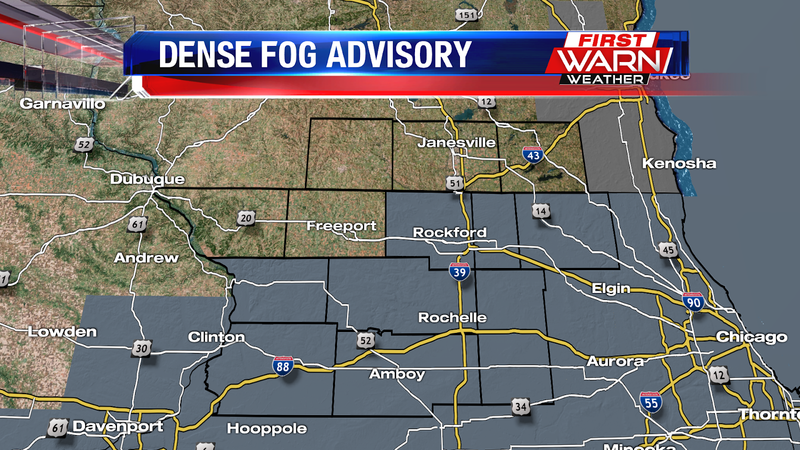 A dense fog advisory has been issued for Carrol and Whitesidecounties until 9 PM this evening. 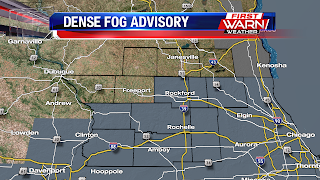 A dense fog advisory has also been issued for Winnebago, Boone, McHenry, Ogle, Lee, and Dekalb counties until 4 AM tomorrow morning. With this fog being so dense, this will contribute to visibilities being as low as a quarter of a mile or less in some areas. Temperatures right now have dropped into the low 30's for areas underneath this dense fog layer. 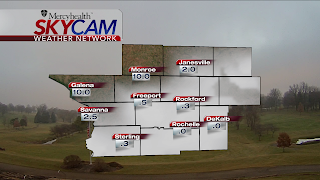 Places to our northwest, however, such as Galena and Monroe are a bit warmer as the fog up there has dissipated. Take it slow on the roads and be sure to give yourself extra time on the commute Saturday morning. How quick the fog evaporates tomorrow morning will have an impact on just how warm temperatures will be Saturday afternoon. The longer the fog sticks around, the cooler the temperatures will likely be across the viewing area. We had a little bit of wintry weather this morning. Much of the precipitation stayed off to our north over portions of central and southern Wisconsin. 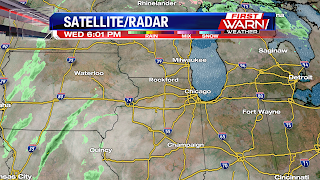 Some light rain showers likely tomorrow afternoon and evening. After that, low 40s are the story Friday and into the weekend. 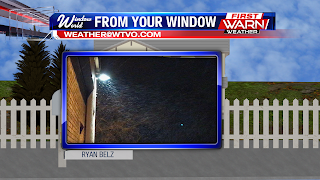 Take a look at this picture from outside of our studios as the light snow/wintry mix was coming down this morning. 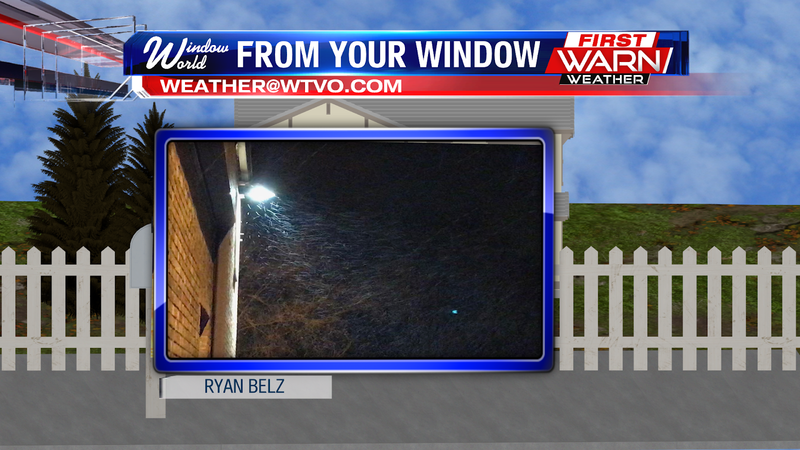 Not much of the light snow/wintry mix was sticking to the ground. Like I mentioned, low 40s are the story Friday and into the weekend. 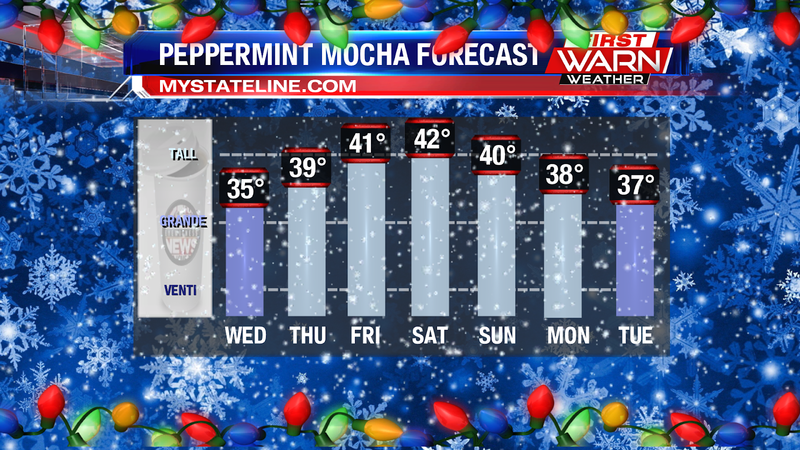 With that said, you will only need a tall peppermint mocha during the weekend. 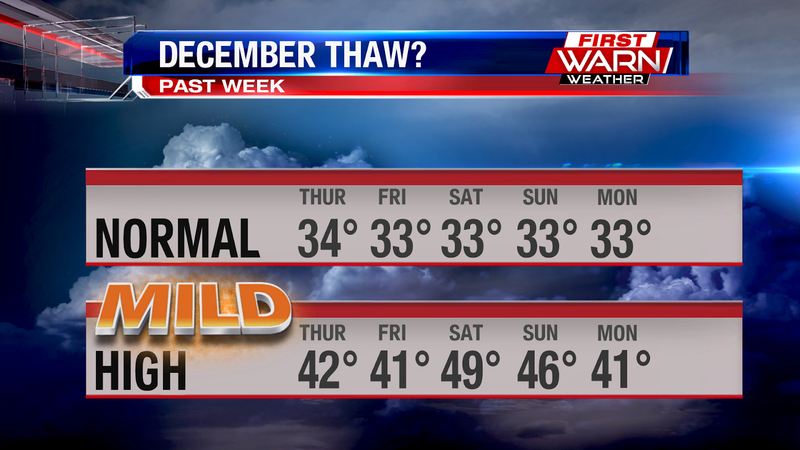 As we go into early next week, we keep highs slightly above average. 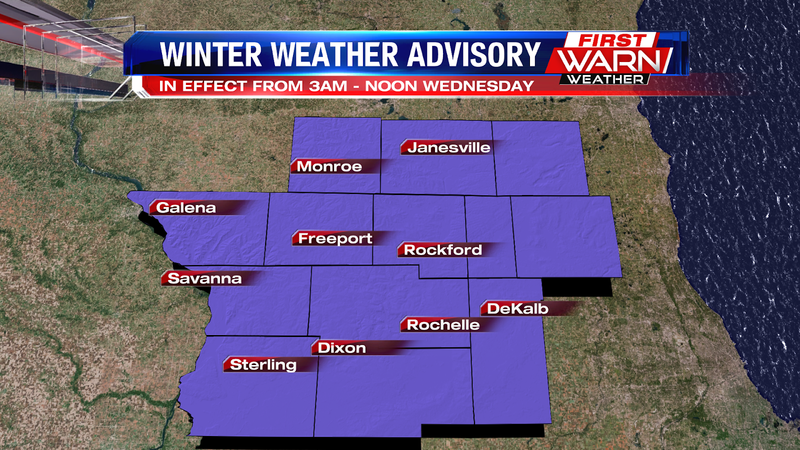 1:15pm UPDATE: A Winter Weather Advisory has been issued for the entire viewing area from 3am - noon Wednesday (tomorrow). 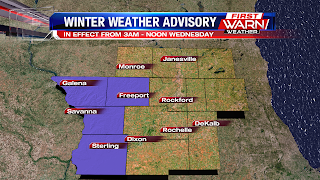 A Winter Weather Advisory has been issued for Jo Daviess, Stephenson, Carroll & Whiteside counties from 3am - noon Wednesday. Expect mixed precipitation to move into the area after midnight, and then will transition to light snow as we go into the morning commute. 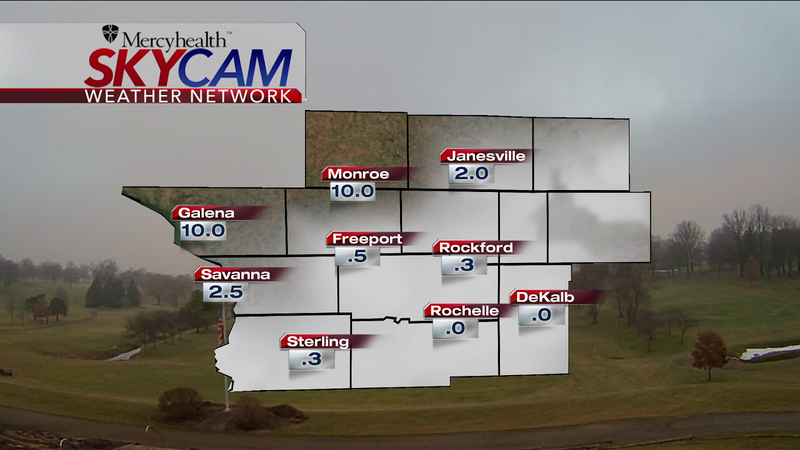 Dense fog overnight has lingered into the morning hours throughout the Stateline. 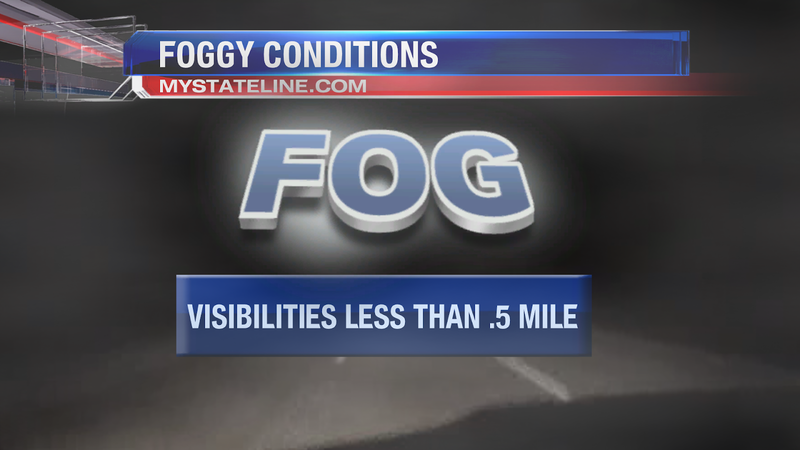 This has created difficult driving conditions as visibilities less than half a mile. 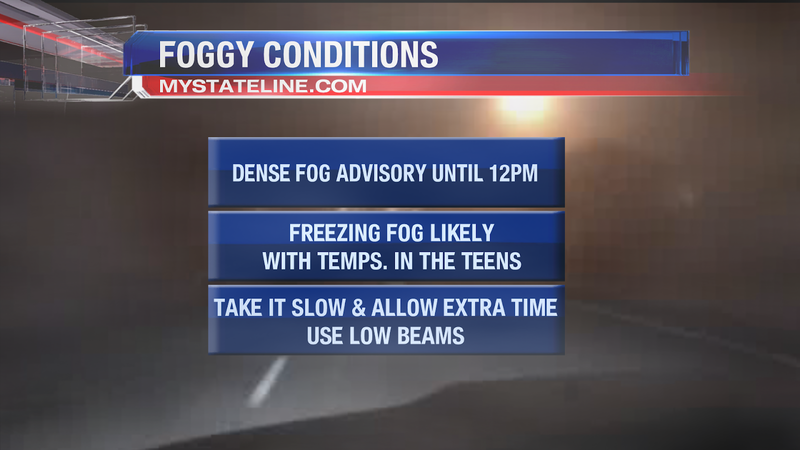 A Dense Fog Advisory is in effect until 12pm due to the foggy conditions and reduced visibilities. The Dense Fog Advisory has not been cancelled for all but Lee County. With temperatures in the teens and foggy conditions, freezing fog is likely. 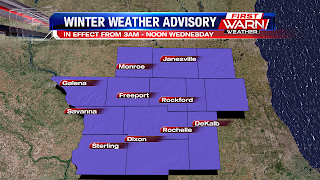 Take it slow an allow extra time because there will be some slick spots. 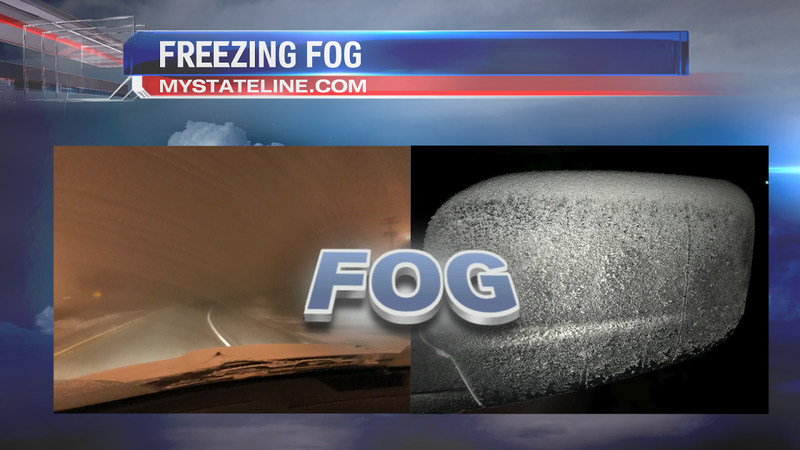 Here is a prime example of freezing fog. The supercooled water droplets waiting to attach to a surface that they can freeze to. Whether that's the roadway, sidewalk, parking lot... or in this case, my truck. 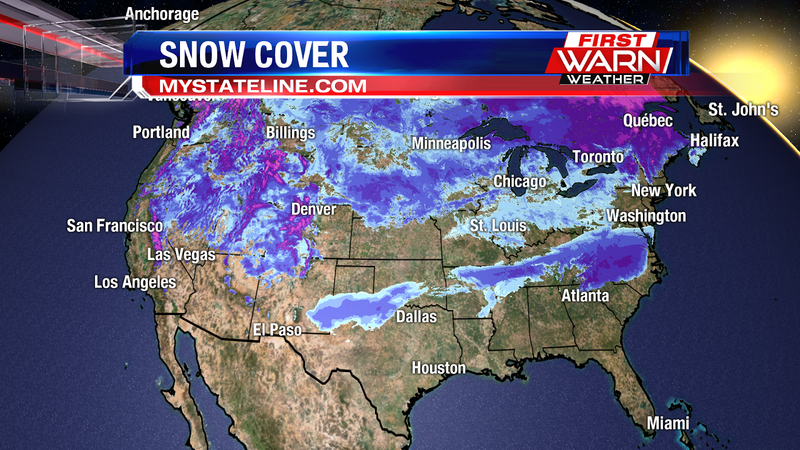 After this weekend's snow storm, 46.7% of the United States is covered in snow. This is the most on this date since 2013. 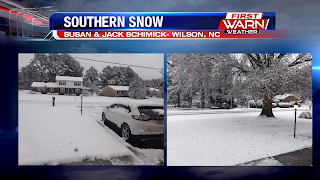 Portions of the North Carolina mountains picked up nearly 2' of snow over the weekend. 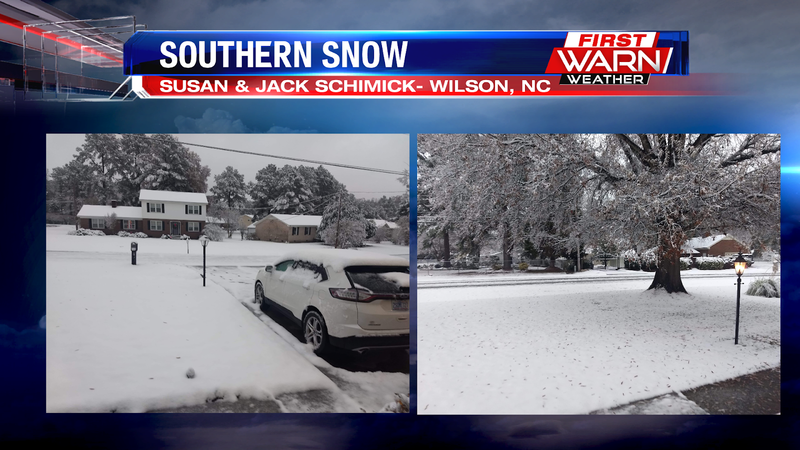 These pictures are from Wilson, NC where they picked up 4" of snow as of Sunday morning. The 8-14 day temperature outlook shows the warmer than normal conditions continuing throughout a large majority of the county.